The Norwegian Pearl The Haven Courtyard area - Looking for photos of the Haven area on the NCL Pearl? Here are a few for you. Reserved only for Haven Guests. That is guests that book a Haven Courtyard Suite. The Suites that qualify to use the Haven are Penthouse suites (Category S5, or S4), a 3 bedroom Garden Villa Suite (Category S1) or an Owner's Suite (Category S2 or S3). If the weather isn't so great or the main pool area is overcrowded, this pool area does get busy too. It is a great area to read a book or listen to some music and relax though. Especially if you want some down time out of the sun. You can even have lunch brought to you here, or order from their special menu. Great for sea days, or after sitting up on the sun deck for awhile. Have you visited the NCL Pearl Haven Courtyard? Or any other Haven Courtyard? We would love to know what you thought of it below. Freestyle cruising is a newer concept in cruising. It has been quite popular and most of the larger cruise lines are now adopting some of the practices. See what it is all about. Looking for more information about the Pearl? Check out our experience on the Pearl. 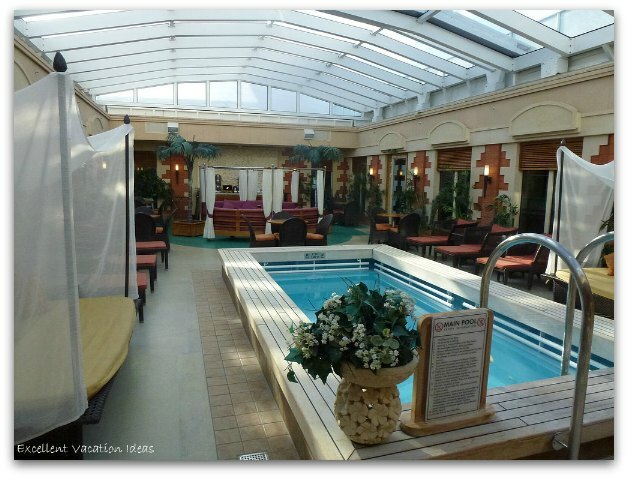 We share what cabin we stayed in, our itinerary and what we liked on board the ship.